Bob Tisdale is sending a few people over here this morning after writing a second WUWT article on the same topic - archived here. (Is Anthony Watts running out of contributors?). Hello all and welcome :) I wonder how many of you recognise the fallacies in Bob's circular thinking? After you've read this article and had a bit of a wander around HotWhopper, you might find what Wotts' has to say on this topic interesting too. Perennially Puzzled Bob Tisdale is a denier of anthropogenic global warming. His denial is amply demonstrated in his latest article on WUWT (archived here, and update here) about a new paper. The paper, by Li et al (2013) is about to be published in GRL. It's available as open access (pdf file is here). 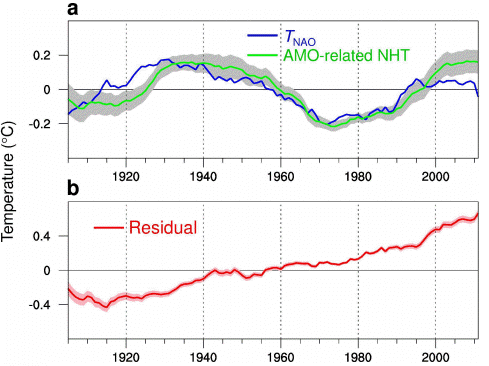 Observational analysis shows that the NAO leads both the detrended NHT and oceanic Atlantic Multidecadal Oscillation (AMO) by 15–20 years. As I read it, the authors are looking to see if they can use the North Atlantic Oscillation to predict changes in Northern Hemisphere surface temperature. It looks to me that they've done a mathematical extrapolation to surmise that the NH temperature will flatten and decrease slightly over the next couple of decades, even allowing for a rise in temperature from rising greenhouse gases. I'm not sure what they used to model future NH temperatures. Fig 3 TNAO and residual NHT. (a) The contribution of NAO variability to NHT (TNAO, blue, see Methods in Supplementary Information) and the smoothed AMO-related NHT obtained by the linear regression of the annual mean NHT onto the AMO index (green). The grey area shows the 2-sigma uncertainty ranges of the AMO-related NHT for the HadSST3 dataset estimated using the 100 realizations. (b) The residual NHT obtained by subtracting TNAO from the smoothed NHT. The pink area shows the 2-sigma uncertainty ranges of the residual NHT for the HadCRUT4 dataset. Bob is wrong in his interpretation. It looks as if he is once again acting as if a cyclic pattern (an oscillation) leads to an overall rise in temperature. But it doesn't. Fig 3a above shows it as an oscillation having no net effect over the full cycle. As well as that, Fig 3b above shows that the Northern Hemisphere temperatures rose by more than 1° Celsius over the past century when stripped of the NAO-related temperature cycle. 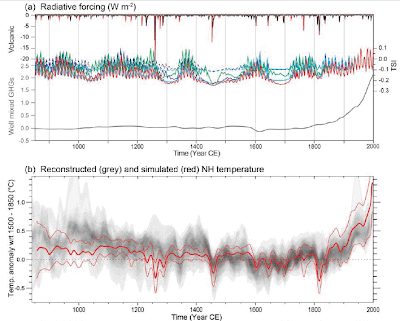 The NH temperature is shown below in Fig 4a from Li et al, with their hindcasting of their NAO model shown as dots and lines. where t is time in years and the coefficients a, b and c are determined empirically by linear regression based on the data over the historical period, so that the regression error of Equation (2) is minimized. 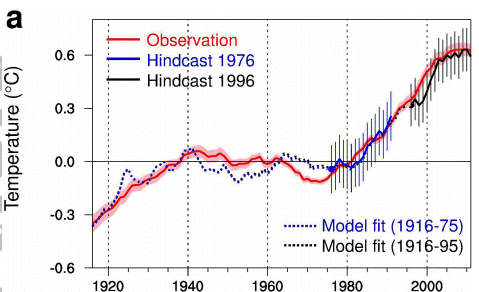 It will be interesting to see if the Li et al prediction is any more robust than the IPCC projections. The CMIP5 models of global temperature (don't know about NH only) also hindcast very well with the 20th century record. However the CMIP5 models project forward based on the physics (under given scenarios) and I don't know the extent to which they reflect the NAO/AMO. the temperature went up without any extra heat input! sea surface temperature went up leading to more heat leaving the system as longwave radiation therefore the energy budget changed. At the same time as arguing that the energy budget didn't change. Bob has a fantastic ability not just for magical thinking but for not recognising his magical thinking, and repeating it over and over again! A question was asked in the comments about the forcings over the past century. Here is a chart from Chapter 8 of the AR5 WG1 IPCC report, which can be downloaded here. Click the chart to enlarge it. Figure 8.18: Time evolution of forcing for anthropogenic and natural forcing mechanisms. Bars with the forcing and uncertainty ranges (5–95% confidence range) at present are given in the right part of the figure. For aerosol the ERF due to aerosol-radiation interaction and total aerosol ERF are shown. The uncertainty ranges are for present (2011 versus 1750) and are given in Table 8.6. For aerosols, only the uncertainty in the total aerosol ERF is given. For several of the forcing agents the relative uncertainty may be larger for certain time periods compared to present. See Supplementary Material Table 8.SM.8 for further information on the forcing time evolutions. Forcing numbers provided in Annex II. 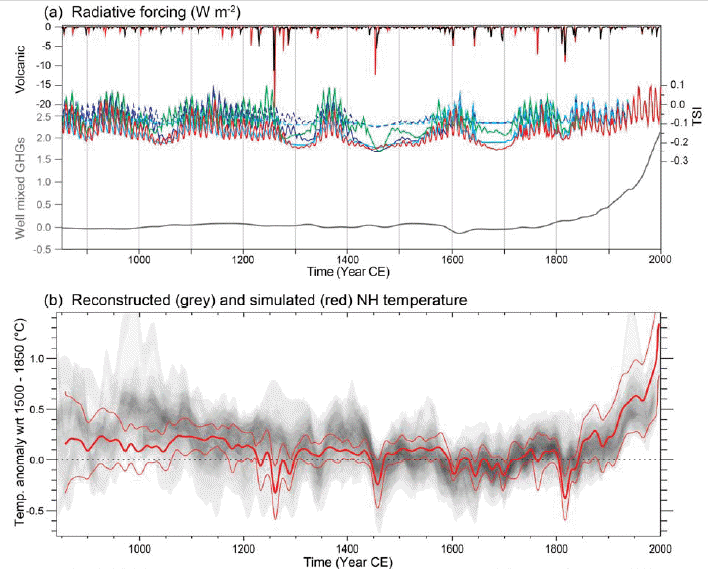 There is also a chart from the Technical Summary (Box TS.5 Fig 1 on page TS-103) showing radiative forcings (volcanic, solar and well-mixed greenhouse gases) going back over the past 1200 years or so compared with reconstructed NH temperature, which I posted in another article. Bob Tisdale: No, I’m not new here. I am well aware of your opinions. I am more concerned with the how the opinions expressed in published research are presented or misrepresented. You are free to use phrases like “stoppage” or “cessation”. The authors of the paper clearly did not, and they say things throughout the paper at odds with your beliefs. Do not bootstrap your opinions onto their work. "It’s time for the IPCC to start thinking about cutting back on their predictions of future global warming by at least 50%. The public is catching on to the fact that if natural variability can stop global warming for 2 to 3 decades, then it also contributed to the warming from 1975 to the turn of the century—something the IPCC failed to account for in its projections." 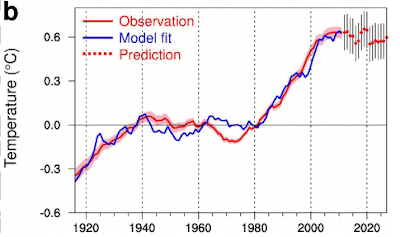 The IPCC has these types of natural variability in their models and they talk about how this influences temperatures. I'm not fully up to date with the details on how this is done but the variability we see from measurements is in the models. You just don't see it in the projections because they use multiple model runs to filter out this noise so they can see the underlying trend. Sou, you say I'm not sure what they used to model future NH temperatures. It's really just their equation 2 (which you've included in the post) and so the temperature change due to GHG is simply bt + c and the coefficients are in the caption for figure 4. From that, they're assuming a long-term trend of 0.0847 degrees per decade and that's what they're projecting into the future. Oh, okay. Thanks, Wotts. So it's just based on extrapolation of the historical trend, not on any physics or estimates of projected CO2 emissions. Is that right? As far as I understand it, yes it's not based on any estimates of projected CO2 emissions. Your post has motivated me to write about this too, so I elaborate a bit more on my thoughts about this paper there. Thee Scafetta comment in the WUWT comments is worth reading. He's valiantly trying to say that this isn't new, but sadly for him no-one cares because that would involve reading "old stuff" and who ever does that? Secondly, he also points out a valid flaw (IMHO) in the Li assumptions. Thanks, William. I've updated the archived version but it doesn't look as if anyone has taken any notice of what Nicola is saying. Not surprisingly but ironically you rely on circular argument to avoid dealing with Bob's points. Anonymous, my article was not intended to pick up on every silly thing Bob wrote. It was as much about the Li paper as Bob's meanderings. You'll have to be more specific in the point you've made. Explain which point of Bob's I avoided dealing with and specify where you see a circular argument made by me, and what it is that makes it circular. Also, have you any substantive comment to make on Bob's waffle or the Li et al paper or my take on either or both? The issue is, Sou, that if Li's theory and maths is correct (and there's a cycle laid over a residual rise) then why is the residual line fairly straight, and why is there a rise from 1920 to 1940? That predates any significant CO2 rise. So if Li et al's theory matches recorded temperatures over the next few years, will you accept that CO2 does not make a significant ("catastrophic") contribution to the temperature (beyond the minor, expected, Arrhenius forcing)? Martin, the way you've worded your question suggests you don't know much about what forcings have acted in the industrial era. These are fairly well quantified. For answers to your first question, Chapter 8 of the latest IPCC report is what you are after. Solar radiation had a bigger impact early last century for example. Aerosols have had a bigger impact from time to time too, for example human pollution had quite a big impact in industrialised countries prior to them cleaning up their act. If you want to see the different forcing represented graphically, look for Figure 8.18 on page 8-121 of the AR5 WG1 report. 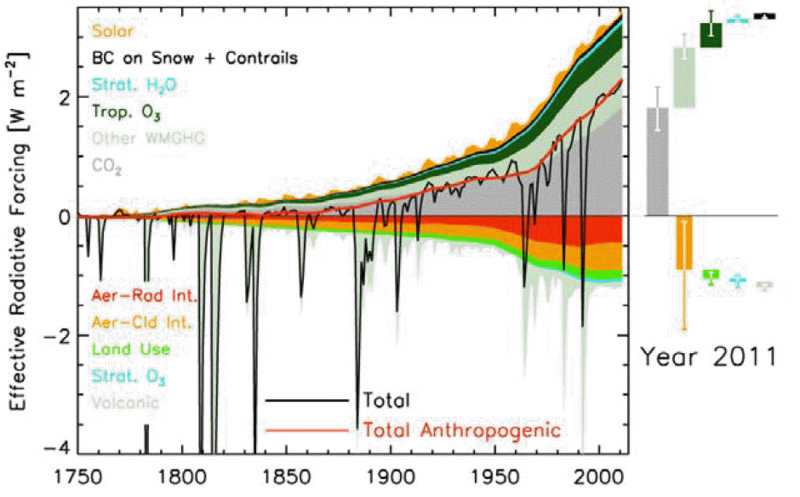 I'll put the chart as a post-script to the main article for you with a link to the IPCC report. Your second question, the onee about the Li paper, is missing the point of their work. 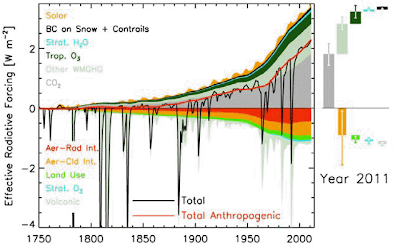 Their hypothesis is not about GHG forcing as such, it's about the relationship between the NAO and the AMO. Their paper makes assumptions about GHG forcing but that's not what they are investigating. There is a similar 'wave paper' out by Curry and 'independent scientist' Marcia Wyatt. I was just thinking this seems a bit like the Tsonis stuff too but then I saw she (Marcia) was lead author on that Tsonis paper from 2012. It will be interesting if this evolves as a competing climate-skeptic science narrative to the mainstream view - something they've been singularly lacking till now. It all seem a bit like mathturbation with no physics (e.g. correlation =/= causation) to me but IANACS.